Bumble is the women-centered dating and networking app that appeared as a direct competitor to Tinder. Instead of just facilitating quick hookups, this app aims to help you find friends, partners, and network with local professionals, all from the same place. Not all apps built to connect people do so while thinking about the actual people involved. 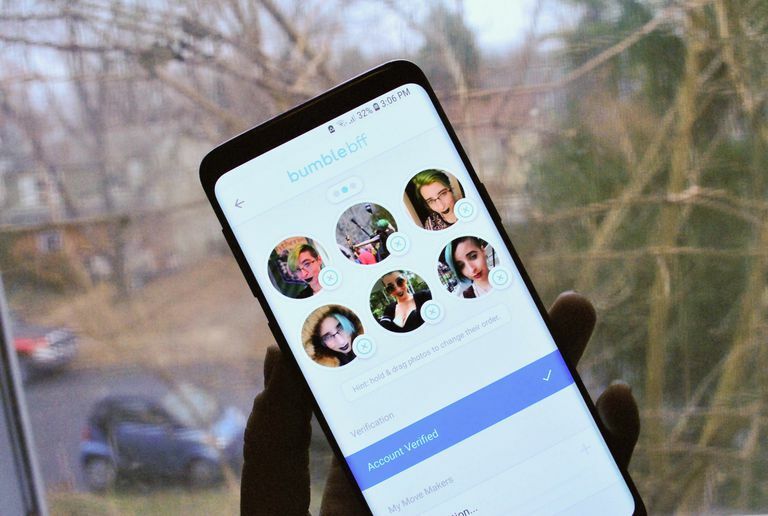 Bumble, was built in part, to empower women and give them a better chance of deeper connections unlike competitors like Tinder. Bumble is broken out into three separate sections: Bumble Date, Bumble BFF, and Bumble Bizz. Each one has its own specific purposes and works a bit differently. Bumble Date is for the people looking for a date night, or a new relationship. You can find new friends in the area with Bumble BFF, and then Bumble Bizz is built for professionals to network in their industry. Each different method of using Bumble requires you to rebuild your profile. This means choosing photos to show off, writing a short bio, and talking about what you are looking for. Rather than a one size fits all kind of networking, Bumble is built to give you agency whether you're dating or networking. You can also connect both Instagram and Spotify to your Bumble profile to give potential matches a better look at you before they swipe away. Matching is where Bumble stands out from other matching social apps. In Bumble Date, all of the agency is handed over to the woman. Not only do both users need to match and swipe their interest, but then the woman will need to make the first move and send out a message. It's a way to make women feel just a little bit safer from abuse or harassment that can often show up in apps of these kinds. Now that isn't to say that you aren't going to run into people that you don't want to deal with. If that happens you have two basic options. You can unmatch with someone, or entirely block them. In either case, this can be done in just a few taps so you can get on with things and not dwell. Open the message center with the person you want to block. Tap the three vertical dots in the upper right corner of the screen. To match with someone all you need to do is swipe left or right. When you open the app you'll see your possible matches. You'll see the other person's profile, photos they've linked, and other information. If you scroll to the bottom of the page you'll also see a place where you can tap on either an x or a checkmark where you can match with someone. You'll also see a star icon at the bottom of the profile, which is the icon for bumble's in-app currency bumble coins and Super Swipes. Using these coins is a way to confidently show another user you're really interested in them, instead of the usual back and forth that comes with meeting people through an app. If you swipe to match with someone, and they've already swiped right on you, a screen will pop up showing you the match. This is also an easy time to toss out a hello message to introduce yourself. Once you've matched with someone, and they've matched with you, this person will show up in your match queue. This section of the app is found by hitting the message icon in the upper right corner of the screen. Your Match Queue is a horizontal row that includes a green circle with people who are interested but you didn't swipe match with, and a row of everyone you did match with. Under that, you'll see conversations. By tapping on the icon of a person you match with, a chat bubble opens up and gives you the chance to chat. If the two of you haven't chatted within the first 24 hours, the match expires and you'll have to match again in order to get to know each other. The chat function inside of Bumble is also pretty solid so far as these things go. You can text, send gifs or even throw photos in there as you get to know this new person. It makes it easy to keep things to the app until you're sure that you want to move off the app. Each different way of using Bumble comes with its own crowd of people for you to connect with. However, you can't see possible matches for Bumble Bizz while using Bumble BFF or vice versa. Switching methods is super easy to do and lets you move back and forth with ease. Just remember to set up the profile for each method so that you can look forward to as many matches as possible, and you'll be good to go. Tap the top of the screen where the method of Bumble you are logged in is displayed. It will say Bumbledate, Bumblebff or Bumblebizz. Swipe left or right to select the method of using Bumble you'd like to use and tap the switch button. With Bumble, the more information (and the more of your personality) that shines through on the screen the more matches you can expect. To that end, we've put together a few tips for optimal matching! Show off in photos: You can upload 6 profile photos for each method. Show off your personality with photos of pets, friends, family, and hobbies! Rock your Profile: You can choose to disclose whether you drink, smoke, have children and more through quick questions. While none of these answers are mandatory, by answering them you can ensure that you get higher quality matches. Likewise, you have room to write out what you're looking for, so be sure to talk yourself up. Let what's awesome about you shine through! Chat it up: After making matches be sure to send a message! Whether it's a quick gif or a sweet hello, the easiest way to meet people is by talking to them. Likewise, if you don't strike up a conversation within the first 24 hours that match will expire, so be bold and make the first move!